If you’ve got a compressed air system, then you’ve got condensate. Hopefully, you also have condensate drains on aftercoolers, filters, dryers, tanks, and air lines throughout your system. Condensate drains are often overlooked but serve a vital function. Condensate is mostly water, but it also contains oil, dirt, and other materials. If you aren’t properly draining it from your system, you can contaminate your products and cause wear and downtime in your production equipment. “Demand” drains automatically activate to remove condensate but only if it is present. “Timed” drains automatically activate based on timers, whether condensate is present or not. Manual drains are simply valves that rely on someone to open and close them. Although not as popular as they once were, timed electric drains are still relatively common. They have been around for years and are comparatively low in price. These drains have two timers, an interval and duration timer and automatically open based on these settings. When they open, compressed air is vented and pushes out the condensate. They are simple and most people think of them as a “set it and forget it” solution, but they will vent costly compressed air whether condensate is present or not. The timers can be adjusted seasonally to minimize wasted air…but we’ve never seen it done. Also, timed drains blast high pressure air into the condensate (AKA oil-water) separator. Depending on the fluid type, this can create emulsions which inhibit oil/water separation. Further, the high pressure air may damage some types of condensate separators. Another solution is the automatic demand drain, which only activates when condensate is present, saving valuable compressed air. 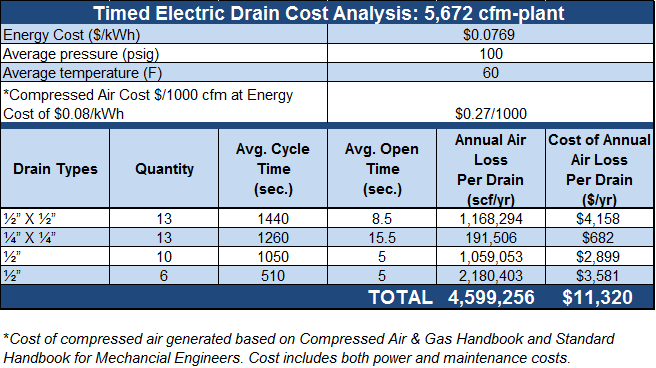 Some cost a bit more than timed electric drains, but the annual savings they provide by not wasting compressed air, makes up for the extra cost. They also improve condensate separator function which lowers disposal costs. So take a walk around your plant and see what kind of drains you have on your filters and tanks. Switching to demand drains could give you some quick and easy savings while improving the effectiveness of condensate disposal.